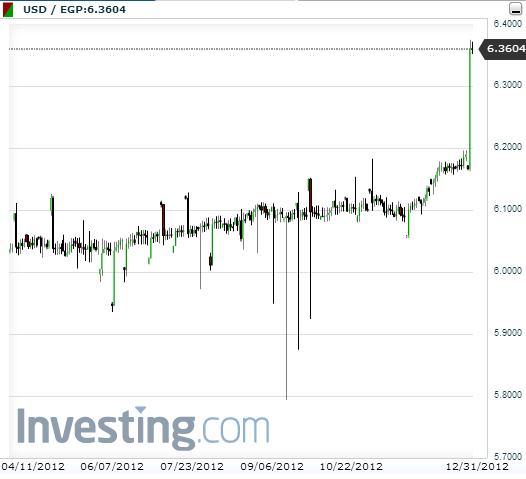 The Egyptian pound (EGP) came under further pressure again this morning (see earlier discussion), with the central bank no longer able or willing to maintain the previous currency peg. BBC: - The Egyptian pound has fallen further against the US dollar, despite efforts by the country's financial authorities to halt its slide on the money markets. The renewed decline came as the central bank held the second in a series of currency auctions. It sold $74.8m at a cut-off price of 6.3050 Egyptian pounds to the dollar, less than the equivalent price of 6.2425 in Sunday's first auction. The auctions are aimed at rationing the availability of dollars, in a first step towards allowing the Egyptian pound to float freely. ESIS: - Egypt is not concerned about the dollar’s recent rise against the Egyptian pound, President Mohamed Morsy said on Monday 31/12/2012. The market will stabilize within days and funds are being pumped in to balance the market, Morsi said during a meeting with Arab media members. In the mean time the pound hit a record low this morning vs. the US dollar in an unprecedented move. As the wealthier population of the country desperately tries to move their savings abroad (and willing to pay up for hard currency), the pound could be facing panic selling. According to a local source, last week a number of commercial banks already ran out of dollars and savers are now buying up euros. With Egypt being one of the largest importers of wheat in the world, food prices are bound to rise further (as it takes more EGP to buy the same amount of food). With the government now being forced to ask the IMF for a loan, austerity measures are inevitable. And for a nation as divided and volatile as Egypt, government austerity combined with food inflation is not going to end well.